The majority of concrete used in construction is hidden but there are an increasing number of developments which use concrete expressively. Visual concrete is available in a range of finishes from the most basic, utilitarian surface, appropriate for a plant room through to highly finished cladding for a corporate headquarters or gallery, and every quality of finish in between. There are many concrete products that are intended to be left unfinished, or exposed and also construction solutions that can be designed to be visual concrete. They include cast in situ, precast, hybrid and masonry. In all cases specific design or selection in advance is necessary in order to establish the quality of finish desired by the client and design team. Recent years has seen many examples of exposed or painted concrete on the inside of buildings, where the structural frame and floors are left unfinished to optimise the thermal mass of the concrete as part of an energy efficiency heating and cooling strategy. Concrete designed to be exposed, but painted should also be identified pre-tender for appropriate specification. 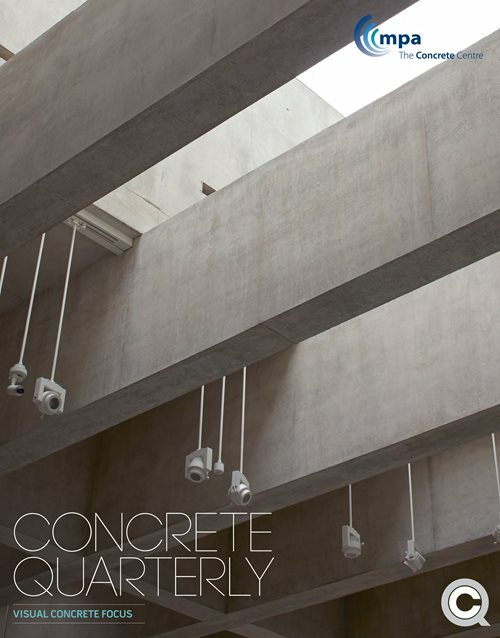 Download The Concrete Centre guidance on Visual Concrete. Identify areas required to be visual concrete. Choose formwork facing to suit the smoothness and texture of concrete finish required. Guidance is available from formwork suppliers. Describe the extent of permissible surface irregularities and construction tolerances, e.g. no. of blowholes/m2. Set out formwork, including tie bolt positions to give an indication of requirements at tender stage. Consider co-ordination of location of day working joints (and movement joints if necessary). Release agents to be compatible with concrete mix, formwork facing and any plasticiser or admixtures. Use a neutral pH nonstaining release agent. Include a clause to prohibit making good without prior approval by the architect of the technique proposed by the specialist contractor. Include a sample panel, to agree quality on-site to inform design team/client and contractor expectations. This is especially important with regard to colour and allowable blemishes. Even application of release agent. Formwork - in particular abutted or sealed joints, spacer positions, areas of damage. Formwork type should be the same throughout. Appropriate falsework to ensure required tolerances are achievable. Consistent supply (in particular cement supply, water/cement ratio and aggregates). Plant and delivery trucks should be cleaned prior to batching and delivery. Control pours to ensure day joints are where required. Appropriate placing of concrete to minimise colour and finish variation. Sufficient compaction with correct equipment e.g. vibration pokers touching formwork can damage their surface and cause staining. Revibrate the top of a vertical pour after 1-2 hours to eliminate colour banding at the top. Struck concrete should be adequately protected during construction works to limit damage and discolouration due to uneven curing.Initially, the struck concrete should be protected from rain. Joints – control junctions, especially between floors and vertical structure. Seal to avoid loss of fines and consequential blemishes. Panel layouts - joints in formwork will usually be visible so consider them as part of the design. Seal joints to minimise visual impact. Try to locate site cut formwork joints in less prominent areas. Construction joints/day work joints - try to locate day work joints in less prominent areas. Release agents – to be applied evenly and strictly in accordance with the manufacturer’s instructions. Striking times – should be consistent where colour variation is critical as exposure will effect curing rates and therefore colour. Repairing surface finish of formwork, even with the best intention is highly likely to permanently affect the final finish. Reinforcement – ties should preferably be stainless steel. Protect exposed reinforcement bars to avoid rust staining to adjacent concrete or formwork. Cover/ spacers – dog-bone type spaces scattered randomly and coloured to match concrete are less likely to be visible on exposed soffits than other techniques. Spacers orientated incorrectly can cause aggregate bridging. Avoid fixing through face of formwork; otherwise very careful filling will be required. Alternatively acknowledge the fixings as a feature of the final finish. Refer to existing examples of workmanship in specification to set standard at tender (this is also useful for clients to see). Acknowledge that some blemishes are unavoidable and they are part of the character of concrete. If a uniform blemish-free surface is required, allow for filling and making good, and specify a finishing coat to suit. Be realistic about quality achievable for the budget. Standard board sizes (1.22m x 2.44m) will be most economical. For very pale concrete mixes an early morning pour of concrete is less likely to be miscoloured due to contaminants in the mix. Consider use of sealant to improve weathering/maintenance. Communicate visual concrete requirements to ALL trades on site to avoid damage. Concrete becomes lighter as it cures. The mix for making good or filling tie bolts should therefore be agreed as late as possible on the sample panel for a closer colour match to be achieved. Self-compacting concrete also gives a good finish and eliminates the use of vibrators. Sample panels are still necessary.